The liberal Supreme Court justice william o. douglas retired in 1975, providing President gerald r. ford his only opportunity to make a Supreme Court appointment. Stevens received high praise and active support from Ford's attorney general, edward levi, and unqualified support from the American Bar Association. During the Senate confirmation hearing, Stevens remarked that he believed that litigants should know how judges viewed the arguments and that it was important to make a record to note diverse views for reference in later cases. Stevens was unanimously confirmed on December 17, 1975, and took his oath of office two days later. From the start, Stevens evinced a concern that the legal system give particular care to ensure the rights of the underprivileged, including Aliens, illegitimate children, and prisoners. However, Stevens cannot easily be classified as either a judicial liberal or a conservative. In a judicial context, a conservative judge generally will not decide issues that he or she believes are within the province of legislatures. Moreover, a conservative typically votes to enhance government power in a conflict between government interests and individual rights. A judicial liberal, on the other hand, tends to favor individual interests and will look beyond the bounds of a statute and past interpretations of the Constitution to decide social policy questions.For example, although Stevens is generally perceived as being sympathetic to the rights of prisoners, his sympathy has not necessarily translated into leniency for criminal defendants. Stevens wrote the opinion in United States v. Ross, 456 U.S. 798, 102 S. Ct. 2157, 72 L. Ed. 2d 572 (1982), wherein the Court held that police may search compartments and containers within a vehicle even though the contents are not in plain view, as long as the search is based on Probable Cause. Probable cause, the same standard needed to obtain a Search Warrant, is typically determined by a magistrate, but this case effectively gave that power to the police in searches of vehicle containers. One of Stevens's earliest opinions was Young v. American Mini Theatres, Inc., 427 U.S. 50, 96 S. Ct. 2440, 49 L. Ed. 2d 310, (1976). He wrote for a plurality of the Court, upholding Detroit Zoning ordinances that prevented the concentration of "adult" establishments. The case was significant because the ordinance in question did not require a finding that the establishment dealt in legally obscene materials as a prerequisite to legal action. Before the ruling in Young, sexually-oriented material that was not legally obscene appeared to be entitled to complete First Amendment protection. Stevens wrote that the material in question was so sexually explicit as to be entitled to less protection than other speech, stating that "few of us would march our sons and daughters off to war to preserve the citizen's right to see 'Specified Sexual Activities' exhibited in the theaters of our choice." He reasoned that the zoning restriction did not totally prohibit the availability of the material and was a reasonable action by the city to further its interest in preserving the quality of urban life. This ruling has been the basis for other restrictions that fall short of an outright prohibition of communication that is sexually explicit but not obscene. Over the last eight years, Stevens's opinions have continued to cross the political spectrum, despite the tendency for observers to cast him as one of the "liberal" justices. In Hope v. Pelzer, 536 U.S. 730, 122 S. Ct. 2508, 153 L. Ed. 2d 666 (2002), Stevens wrote a 6–3 majority opinion ruling that a prison inmate had been subjected to Cruel and Unusual Punishment in violation of the Eighth Amendment when prison guards handcuffed him to a hitching post as punishment for disruptive behavior, even though the inmate had already been subdued. Stevens said that the prison guards knowingly subjected the inmate to a substantial risk of physical harm, to unnecessary pain caused by the handcuffs, to unnecessary exposure to the heat of the sun, to prolonged thirst and taunting, and to a deprivation of bathroom breaks that created a risk of particular discomfort and humiliation. That same year Stevens also wrote a 6–3 majority opinion ruling that the execution of mentally retarded criminals violates the Eighth Amendment's guarantee against cruel and unusual punishment. atkins v. virginia, 536 U.S. 304, 122 S. Ct. 2242, 153 L. Ed. 2d 335 (2002). Citing "evolving standards of decency," Stevens said that his decision was informed by the consensus reflected in deliberations of the American public, legislators, scholars, and judges that have taken place over the thirteen years since Penry v. Lynaugh, 492 U.S. 302, 109 S. Ct. 2934, 106 L. Ed. 2d 256 (1989). In Penry, the Supreme Court held that two state statutes prohibiting the execution of the mentally retarded, even when added to the fourteen states that had rejected Capital Punishment completely, did not provide sufficient evidence of a national consensus. In Atkins, though, Stevens emphasized that sixteen additional states had passed laws barring execution of the mentally retarded since the Penry decision was handed down. Stevens surprised many observers with his dissenting opinion in Kyllo v. United States, 533 U.S. 27, 121 S. Ct. 2038, 150 L. Ed. 2d 94 (2001), where five justices found that the use of a thermal-imaging device aimed at a private home from a public street to detect relative amounts of heat within the home constituted a "search" within the meaning of the Fourth Amendment, and thus the use of that device was presumptively unreasonable without a warrant. Justice Stevens argued that thermal imaging did not constitute a Fourth Amendment search because it detected only heat radiating from the external surface of the house. Stevens surprised no one with his dissenting opinion in Bush v. Gore, 531 U.S. 98, 121 S. Ct. 525, 148 L. Ed. 2d 388 (2000), however, where seven justices concluded that the process devised by the Florida Supreme Court to recount the popular vote in the 2000 presidential election violated the equal protection clause of the Fourteenth Amendment. Only five justices agreed that there was insufficient time to fashion a remedy that would fairly and lawfully allow the votes of Florida residents to be accurately counted for either presidential candidate. As a result, the nation's high court effectively ordered the Florida recount to stop, which meant that george w. bush would become the forty-third president of the United States. 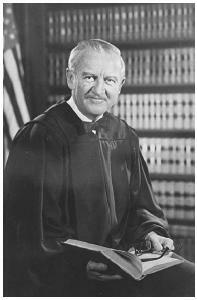 In his dissenting opinion, Justice Stevens argued that the Equal Protection Clause does not limit the states' power to design their electoral processes—including substantive standards for determining whether a vote had been legally cast. Consequently, Stevens believed that the U.S. Supreme Court should have deferred to the Florida Supreme Court's interpretation of those standards and allowed the recount to continue. Under the majority's own reasoning, Stevens wrote, the appropriate course of action would have been to remand the case so the Florida high court could establish more specific procedures for implementing the legislature's uniform general standard of "voter intent." But in "the interest of finality," Stevens continued, "the majority effectively orders the disenfranchisement of an unknown number of voters whose ballots reveal their intent—and are therefore legal votes under state law—but were for some reason rejected by ballot-counting machines."